Another year, another RADs. But not just any RADs. 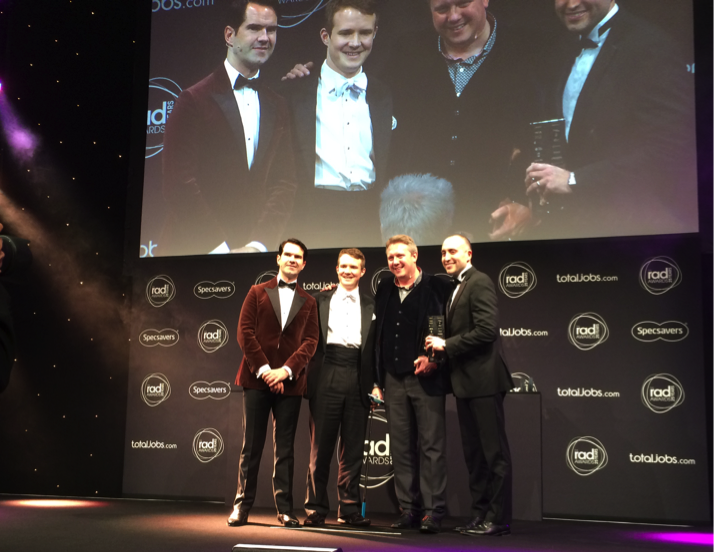 Last year’s RAD awards was a special night for us. It was the night that we won our first RAD award. Our #TweetShop created loads of buzz, great results and scooped the Best Ambient/Outdoor prize. It was a special feeling for us all – and a fantastic way to round off our first year in business. One year on and we’ve doubled in size. We’ve moved offices twice. And we’ve begun working with a whole host of new and exciting clients. You can imagine, then, that we were thrilled to find out we’d been shortlisted for three awards this year. Two for our work with Tesco: Best Graduate Recruitment Campaign; and Best use of Mobile for our first-of-a-kind Snap It! on-campus innovation. And finally, Best Recruitment Literature for a new client of ours, Berwin Leighton Paisner. Being the 25th anniversary for the RADs guaranteed it would be a special night anyway. And we were hoping to make it extra special by picking up another award. Well, we’re pleased to say we weren’t disappointed. And nor was our client. Our work with Berwin Leighton Paisner to turn their graduate recruitment brochure into more of a story with a really human and conversational feel impressed the judges. You can look at the brochure here. It really was a great end to an even greater year. Well done to all the shortlists and winners from the evening, and of course to our clients who’ve trusted us and provided us with the opportunity to deliver some exciting and creative work. 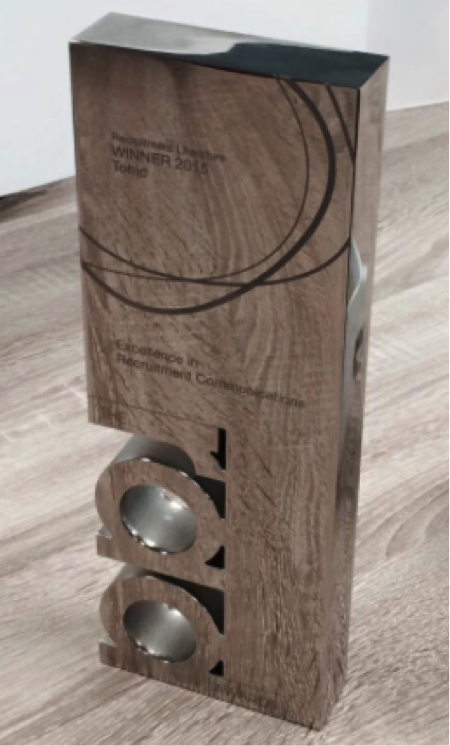 Here it is, the award in all its glory! 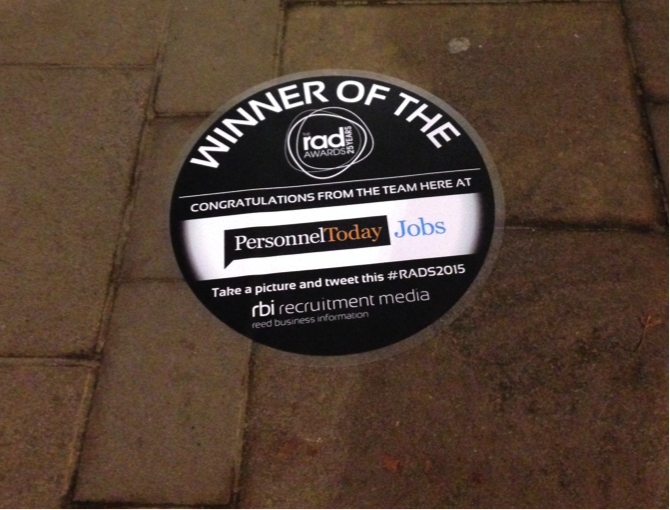 Thanks to the RAD Awards for making it a memorable achievement with this sticker placed outside our offices. Nice touch! Last year, Mars created a world-first in student engagement with its magical tweet-activated vending machine. This year it took things to a whole other level with Mars Hide and Tweet. TweetShop was creative, massively effective and totally ground-breaking (in the recruitment world at least). Over 21 days, it went out to eight campuses and nearly 2,000 people grabbed the chance to tweet for treats. 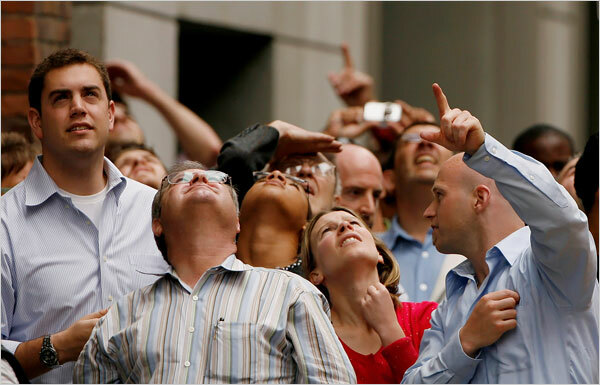 This year Mars wanted to increase that reach but budget meant we couldn’t transport TweetShop to more locations. So we created an online hide and seek game using Google Maps technology. #MarsHideAndTweet happened in two distinct phases. First, a week-long online competition that was open to universities across the UK. We hid the TweetShop in five different European cities on our custom map over a period of five days. And every day students raced to hunt it down following a series of cryptic clues that were tweeted over the course of the day. We went out onto 9 campuses to build excitement face-to-face with students and promote the competition with motion-sensitive plasma TV screens that projected a series of different messages as people walked past them. In the week running up to the competition we began sparking twitter conversations with a series of innovative vines. Emails, posters and flyers, as well as posts to the Marsgradsuk Facebook and Twitter pages, were used to explain what #MarsHideAndTweet was all about and to promote the competition. More than 350 people registered to play. And within minutes of the competition going live on Monday 3rd February the guesses began coming in, even before the first clue had been tweeted. The race was on because the first person each day to find and tweet TweetShop’s location to @marsgradsuk won a free weekend break for two people to that day’s city. A dedicated team responded to those guesses with hundreds of personal tweets back to players. The conversations and the excitement grew and grew. On top of daily competitions there was the main event, the opportunity for one university to win TweetShop, fully-loaded with Mars freebies, for its campus for a week. The winner would be the university whose students made the most tweets over the course of the week. The competition was fierce and so close that in the end there was nothing between Coventry and Reading so a decision was made to send TweetShop out to both universities. Win, win – in true Mars make it mean more style. 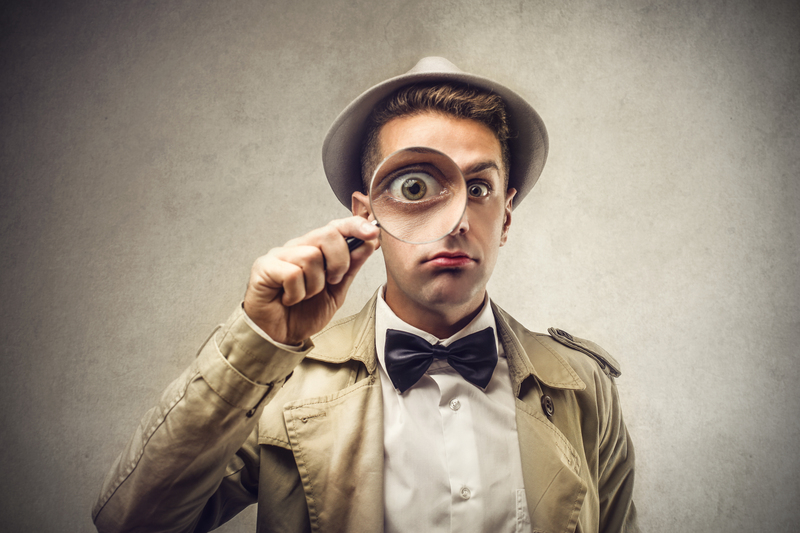 How can Google+ help employers get found by people that matter? Hello, and welcome to our final thoughts on Google Plus. Thanks to those who’ve been keeping up to date with this series, we hope you’ve enjoyed the content and found it insightful. For those of you who’ve just joined us, each week we’ve been sharing thoughts on the social network, around how employers can make best use of this largely overlooked channel, to become more social, personal, human and ultimately more valuable to the people they hope to begin a conversation with. Let’s start off with a quick re-cap. Google Plus has a big user base. Surprisingly big, in fact. It’s now the second largest of the lot and is growing faster than its competitors. It’s predicted to outgrow Facebook in 2016. It’s not too hard to understand why – it has some really useful and unique features that may just be the difference when it comes to building your employer reputation in the social space. We’ve already talked about how Circles help you be more personal, how Hangouts help you be more human and how Communities can help you become more valuable. So what else is it keeping up its sleeve? Well, there is one last hidden gem that Google Plus offers. It’s not as obvious as the ones we’ve mentioned, and you probably have no idea it exists unless you’re a bit of a techie. Google Plus content is treated exactly the same as a regular page on the web. Meaning it will appear in any Google search. And as Google is keen to give priority to content that has validation, it can also gain in page rank. How does that happen? Well, social networks are populated by real people who share, re-tweet, +1 and Like. These are called social signals and Google’s search engine watches these signals like a hawk, which help dictate popularity of content and thus search rankings. So if you share something with your community, and it receives plenty of +1’s, Google will automatically give that priority in any Google search. Let’s put this into context. You’re a law firm that’s looking to engage talent earlier. You’ve created your own community for law students in their first year and you’re regularly sharing content, writing blogs and delivering thought leadership on all things legal. There’s a high level of interaction because you’re using Circles and Hangouts to deliver personalised content to the community and, as a result, you’re having meaningful, two-way conversations. Naturally, people +1 your content, share and then re-share (which you can monitor with Google Ripples… remember?) with their own Circles and Communities. Now, let’s take Sarah, an 18-year-old who’s just finished her A Levels and is interested in a career in law. She wants to join a graduate scheme but is unsure which firms would be right for her. She decides to do a Google search: “Undergraduate law firm internships”. Google begins to send out the crawlers and the usual suspects come back – such as ratemyplacement.co.uk, summerinternships.co.uk – but then your page appears three spots down. You’ve not done anything extraordinary in terms of SEOing your site; you’ve not paid for sponsored Ads or Pay Per Click campaigns. Quite simply, Google has given you priority because of your effective use of Google Plus. And why wouldn’t it? It’s a Google product! Naturally, Sarah sees that this must be directly related to her search and decides to check out your page. Of course, she finds a wealth of information there to help her along her journey, and people in the same position as her from all over the world. Naturally, she decides to take part in the conversation and turn to your firm as a source of advice, comfort and thought leadership. In today’s crowded marketplace, being visible is half the battle won. In a world where employers are trying to shout louder and harder to get their message heard, surely it makes sense to make best use of the tools available and begin to build conversations that count, in a more effective (and cost effective!) way. Please do let us know what you think and of course, feel free to share thoughts on whether you think Google Plus offers businesses a new dynamic – we’d love to hear your thoughts. Don’t forget to like and follow us for more content. We’ll be back next week to share more tonicthinking around employer reputation. 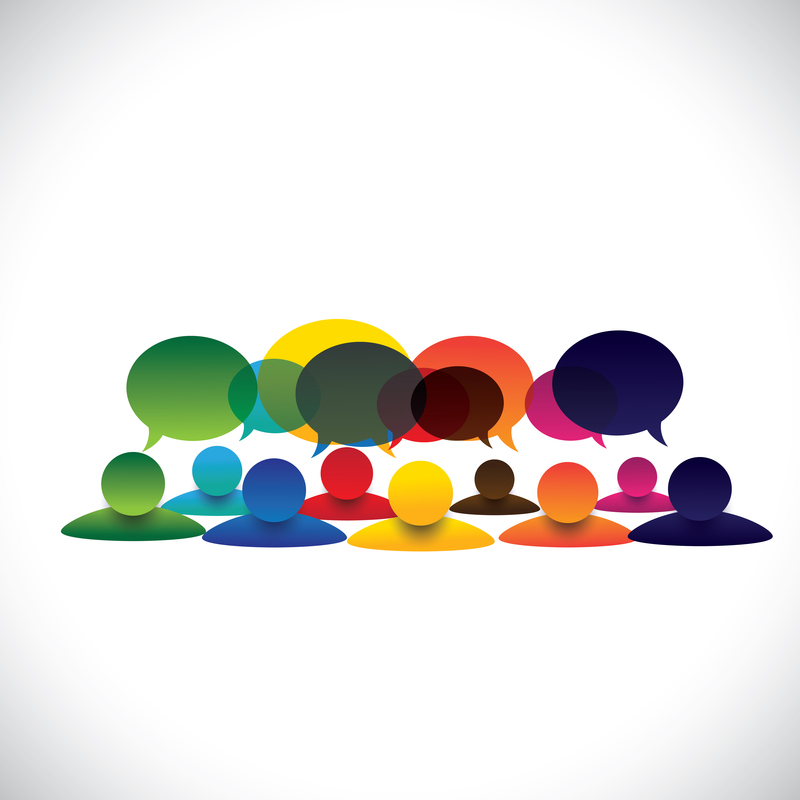 So what is Social proof? Well, it’s widely been studied in the field of social psychology, and is tied to the human condition that results in the Fundamental Attribution Error. Yes, I know what you’re thinking! In laymen’s terms it simply means that given limited time and motivation, people will often evaluate people, products, companies, jobs (and most other things) based on how those around behave toward them. It’s caused by a ‘fear of missing out’. Ask yourself this. If you were walking past a coffee shop, and you saw that there was a queue stretching right down the street, naturally you’d begin to wonder what’s so special that it’s got all these people waiting to get a slice of the action? How intrigued would you be? Would you let yourself miss out? I guess in this case it largely depends whether you like coffee, but you get my point. The way we all make buying decisions had changed drastically. We’re all far better equipped at seeing through traditional marketing hyperbole. Instead, the views and opinions of those around us play a much bigger role in influencing how we feel about a particular ‘thing’. Those people could be your friends, family, colleagues or peers. Perhaps those we’ve never met before. And here’s the tenuous link to TripAdvisor – it’s essentially the Glassdoor equivalent of recruitment, but for holidays. But the principals are what matter here. It’s a thriving community full of those who are looking, and those looking to be influenced. Social Proof has been used for a long time in selling us all products and services – celebrity endorsement is a simple example of this, as is the current KIA ad which majors on the opinions of ‘people like you’ rather than what the company thinks you need to know (obviously the good things have been picked out here). But rarely is it a topic that’s talked about in the world of recruitment. And it’s an interesting one. We all know that we we live in a more social, mobile and connected world (I think! ), as we see many employers ramping up their activity on various social platforms. Some do it well, others not so well. Heineken have a great example of crowd-sourced recruitment, which I thoroughly recommend watching here. We’ve also created a twitter activated vending machine for Mars which toured UK campuses to help recruit graduates. You can see a video for that here. Yet when the large majority or employers and recruiters talk about social recruitment the focus tends to be on the same things. Channels and self-promotion. Let’s push out yet more messages and job posts to people through different channels. That’s bound to get us some applications. This is largely missing the point and replacing like for like. What you should be asking is what value could we add to the talent communities we want to be invited into? How are we going to tell them what they need to know, where they want it and how they want it? And, how are we going to get people talking about us, become advocates of us and encourage more of the right people to join? If we go back to thinking about the way we make buying decisions the use of advocates to do your selling for you is the most powerful tool in your armoury. Yet it seems many organisations have an inherent fear of letting their staff actively talk abut their company and their work with their own communities. But why is that? By having a point of difference and engaging with talent communities (internal and external) in an authentic and human way and by ensuring that you live up to the promises you make, social proof should be nothing more than ratification of your efforts. It’s impossible to keep everyone happy all of the time. But, by acknowledging that these conversations are taking place and more importantly, being present when they happen, will give you a much better hope of influencing them as opposed to sticking your fingers in your ears and pretending they didn’t happen. Visit tonic-agency.com for more insights and get in touch! 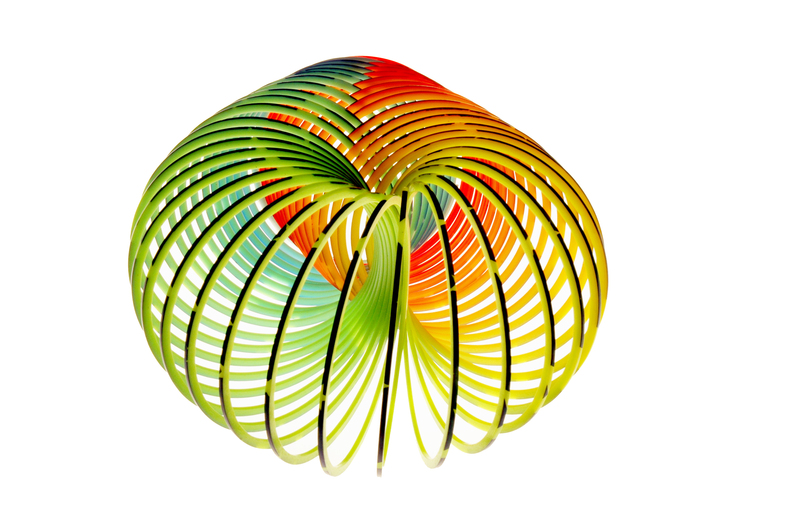 Where is recruitment’s Higgs Boson? You may have seen that CERN held a press conference on Wednesday (4th July’12), to announce that as near as is ‘absolutely’ certain (at the 5-sigma point), they’ve identified that the Higgs Boson does exist. This is important because it means that all the things we thought we knew about how the universe works are still, as far as we can tell, true. There’s no need to rip up the physics rulebook and begin again. This is a good thing. So, what’s that got to do with recruitment – an inexact science at the best of times – and what can we draw from it? How are the two linked? Well, perhaps more than you might think. Link number one: At the end of 2011 I visited CERN for the first time. What an amazing place. Aside from meeting Robert Cailliau, who co-developed the www with Tim Berners-Lee (Robert’s now a bit of a hero of mine and no fan of Facebook let me tell you because at its heart it’s not open source), it was a great opportunity to rub shoulders with other people from around Europe, all interested in the future of recruitment and prepared to share their thinking. You see, that’s the great thing about CERN. Collaboration and sharing are in their DNA – their basic tenet is that we can achieve more together, and they’re absolutely right. The people attending the conference were there at their own expense to talk about the challenges of recruiting, and to outline their approaches to solving the problems they’d encountered. I think it’s fair to say that we all walked away inspired and informed about how to tackle the new recruitment world. The presentation I gave (with Marcus Body from Optimal), had four main messages: that there’s more information available to help make the right careers decisions; that employers control very little of this detail; that candidate behaviour is changing because of the availability of information; and, that this new recruitment paradigm has more in common with the way in which recruitment worked before the advent of push messaging. Which only really began as print media came into being in the middle of the nineteenth century. The future, we suggested, was based on conversation and community, rather than telling (or selling to), an unexpecting audience about a role that we have vacant, and then expecting the most talented people to believe our every word. Link number two: This one is a bit more tenuous re: the Higgs, I’d grant you, but it’s had recruiters scratching their heads for just as long. What is the one thing that holds the recruitment universe together, but has until recently been just as difficult to measure, see and prove that it exists? Your answer may be different to mine but to my mind it’s candidate sentiment. We’ve spent so many years working out what it is that we (as employers) want, and what we (as employers) want to offer, that we’ve forgotten to ask what it is that the people we need to attract, engage and excite are interested in. Conversation is as much about listening as it is talking, and if we begin our employment communications by listening to the voices of the people we need to hire or retain, the output of our efforts will be better quality a lower cost and ultimately better ROI from those people. Social media is of course the route to holding the conversation, but if we carry on just putting out messages that we hope are right, we’re really just creating another monologue. We now have the opportunity as employers to begin to listen, to understand what people think about us now, and what we need to talk about to change opinion or to interest the right people in our offer. This also has the benefit of dissuading those without the right value, competency or skillsets. We can be much more targeted in our talent attraction strategies – less like a random particle collision. Link number three: Physics is an inter-linked discipline and so is your employer brand, or more specifically, your brand in general. The way I feel about your organisation is based on a combination of factors. If I visit your careers site I’ll also see your main site, reading information about what you do, and how well you do it – so there’s an easy link there to your corporate positioning and your products or services. If I’m still open-minded and engaged, I may well get the opinion of other people – and importantly that’s not just my peer group or those people who advise me about my career. I’m equally likely to go to a place where I can get independent views about you and your business. What will I find there? Link number four: Knowing that the Higgs exists allows scientists to proceed with greater certainty toward the future. An environment where the ‘dead-ends’ and inaccurate results that might have be reached are less likely. It takes away any doubt. The same applies to your brand and the conversations you may have using it. By better understanding the community you need to engage with, their needs and preferences, you will be better informed about what your employer brand should be achieving for you – and this will allow you to be much more precise in measuring its effects, and its impact. Link number five: The absolutely almost certain discovery of the Higgs has been a collaborative process that’s taken many years to achieve. By working together the scientists at CERN and other installations around the world have created a working environment that allows for the long-term benefit of all concerned. If we begin by looking at the way in which people make career decisions – again starting with the audience rather than we want to get from them – recruitment actually works in the same way. Logically, people, especially those at the beginning of their career, cannot possibly have a preferred employer. Career decisions begin by deciding that they like the look of an industry or sector or job type – and then they begin looking at the biggest or best employers that match their criteria. Some employers – like those in the Power sector – are beginning to group together to build sector value propositions to address this, a trend we see growing over time. The have committed to a longer-term approach to solve some big demographic challenges. But, by acting collaboratively they are increasing the visibility of an industry, allowing greater engagement with the people they all need. This has the potential to grab the attention of difficult to reach groups, converting opinion toward the sector and increasing the attractiveness of them all. By working together, sharing budgets and effort, they will all benefit. 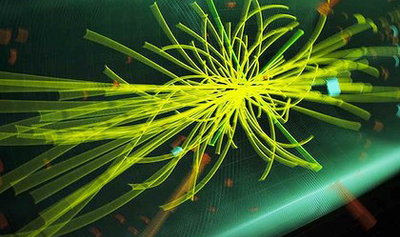 So what has the Higgs Boson got to do with recruitment? What can we learn? Arguably more than you might think.